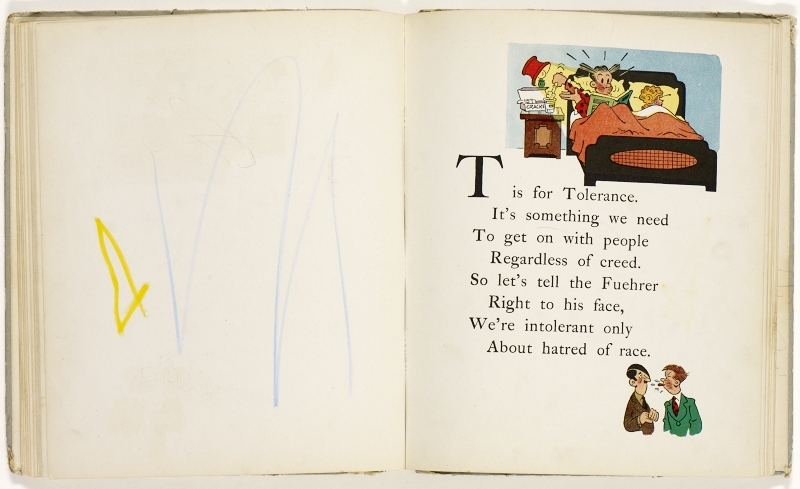 In thinking about some of the Wolfsonian library materials that might be of interest to the Florida International University students taking my America & Movies history class on wartime propaganda this semester, I first thought of the numerous children’s propaganda books in our collection. Many of these children’s books were donated to the library by Pamela K. Harer. Cartoon characters, of course, were enlisted in the fight against the Axis during the war years, and some of our most cherished and popular cartoon heroes were featured in animated films and printed pamphlets, sheet music covers, and children’s books. A couple of popular Sunday newspaper comic strip characters appeared as well in a wartime alphabet book published for young children. In addition to teaching youngsters their ABCs, Blondie and Dagwood, instructed these children (and parental readers) in proper patriotic behavior.